Sustainable growth prospers on a solid basis – so the innovations of today become the standards of tomorrow. Our research & development division with its extensive lab and testing facilities is our own in-house think-tank. Co-operations with universities and research institutes boost the technological exchange. Top-of-the-range production lines and a sophisticated quality management warrant the best possible products. Several awards and the ISO:9001 certification confirm our course into the future. The RESOL product range includes a range of high-class solar thermal and heating controllers as well as a broad variety of accessories for the efficient use of energy. 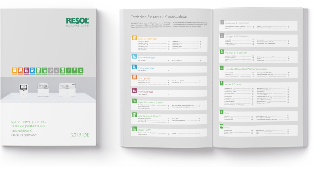 All RESOL products are future-oriented, sophisticated and unique in their design. Just like our ideal: nature! From the very beginning, we accompany your product or sales idea with our know-how! Our product managers will support you throughout the development process and, in collaboration with you, devise the best solution to suit your wishes. Individual housing design is also possible. The safe and easy way to yield monitoring your RESOL controller with the VBus.net visualisation portal. Stop by for a visit and let us convince you of our product portfolio all around heating and solar thermal control technology.